Artists in conversation, featuring Catherine Baker, graduate of the Royal Academy Schools. 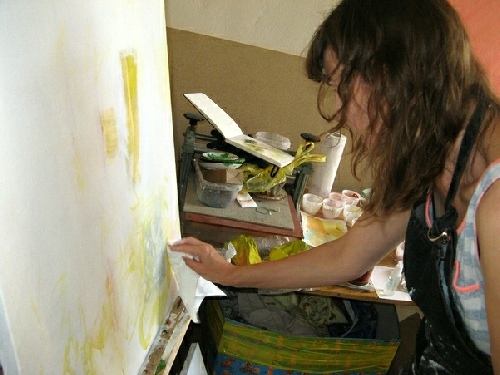 Catherine Baker in her Residency studio at Jičín. 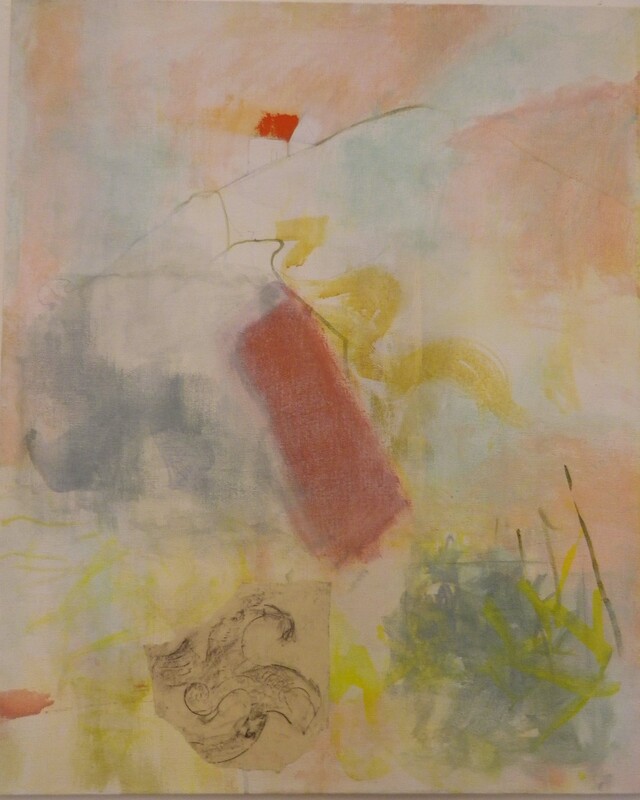 Catherine Baker is interested is in what forms the essential essence of a landscape that she is drawn to. Personal memories, associations and traces of the history of a place are important to her. She’s looking for poetic rhythms, echoes: some kind of resonant statement. CWP: What initially got you into painting and painting the landscape in particular? CB: It was there in my upbringing as my mum and dad both went to art college and there were plenty of art books in the home. But I didn’t consciously want to become an artist until I met an older artist, when I was in the sixth form at school. He opened up a whole new world to me and encouraged me to go to college. Why landscape? I have always found it the best way to express my feelings – out in nature to sense the changing light, shapes, the space, to catch the ephemeral quality of it somehow. CWP: I understand you walk nearly daily in the landscape with your sketchbook; drawing and annotating pages with things that catch your interest like colour, texture, light, shape, line, or part of the history of the land. And then you take these notes back into your studio to distil your field notes through experimental and intuitive painting and drawing processes, towards a simplicity which is at once raw, fresh and open and when there’s nothing more to add, it’s finished. I’m curious about how you have learnt to understand when your work is finished? CB: That’s quite a difficult one to answer. I know when I’ve ‘killed’ it, so to speak, with too much overworking, and I throw away or recycle a lot of stuff. So, the opposite to that is when it feels alive, when it looks to me as fresh as when I have put the first few marks on it. When I’m pleased with something I’ve done on a piece of work I try and resist the urge to carry on with it, to put it away for a few days or longer, then re-assess it with a fresh eye. How I have learnt that judgement must be from looking again and again at work by other painters I admire, where the artist has managed to make the work ‘breathe’ with a beautifully balanced composition of marks and space. I admire and am influenced by people such as the late almost abstract Turner oils and watercolours, Roger Hilton, Prunella Clough, Cy Twombly, later Howard Hodgkin paintings and prints. Catherine Baker, Jičín, Zebín, 2013, Acrylic & collage on canvas, 60 x 76cm. CWP: During your residency at Jičínský plenér, Czech Republic in 2013 you painted ‘Jičín, Zebín’ featuring the area near the Marie Magdaleny chapel. Taking a rubbing of the pattern on a palace door and placing it in your painting created an echo of the curves across the rest of the painting and your striking, yet subtle use of colour is mesmerising. I simply want to step as close as I can get to the surface, nearly catching the feel of a breeze of the summer days it encapsulates. I find time standing still while looking at your paintings and I’m caught in a spell of landscape and history and layers and texture. I wonder what your experience of time is when you are painting? CB: Not sure what you mean exactly, what my experience of time is when I’m painting… do you mean actual physical time as I am painting or what I am trying to convey about time in the work? If it’s the former, when I am really ‘in the zone’, it can take me to another plane, so to speak, like meditation. When I come out of it and step outside of that state of mind, I often find that an hour has gone by when it’s felt like just a few minutes. If it’s the latter, as you say I am interested in the layering of time and history of a place, the marks and traces that are left on the landscape. This idea is manifested literally in the way that I work; building layers, taking away, re-building, leaving space and hints of the history of the painting underneath. CWP: Have you any upcoming shows in the pipeline? CB: I will be showing my two large drawings from my residency at Llwyn Celyn on the site of the building in September this year along with the other artists. Around this time next year in 2019 I will be having a solo show at The Art Shop, Abergavenny. 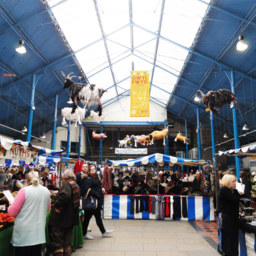 Article sponsored by Heronhurst of Abergavenny.